I don't think I've ever tried so hard to finish a book before. 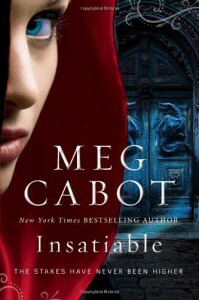 But, INSATIABLE was just so painful to get through that I felt like it was work at times. I've read a Meg Cabot book before, and I really enjoyed it, but this one really fell short for me. I wasn't fond of the characters really, I didn't particularly like the story line, and listening to this on audio, I thought the narrator did a poor job as well. Suffice it to say, I won't be continuing with this series.